Here our children are focussed on developing their friendships, beginning to share ideas and work together. We come together for mealtimes and enjoy deepening our understanding of the materials available. We have empty spaces for the children to utilise as required for large scale work, yoga sessions or dance classes. 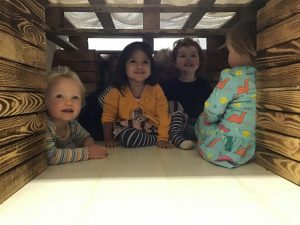 Imagination is in abundance and our children are starting to delight in their role-play skills, becoming more interested in their friends than the educators. Children have access to our garden and we take advantage of the lovely Wish Park which is just next door. Children also have regular trips to the beach, museum and library. 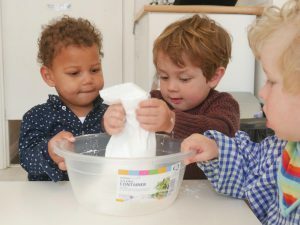 Read about what we offer for babies or pre-school children.